Early start this morning to head to the open surgery at the doctors. Of course, I hit snooze a couple of times before finally getting up, grabbing my gym kit, pulling on ALL OF MY CLOTHES, grabbing a coffee to take out and setting off in the freezing cold to queue outside the surgery. I got there (first in the queue!) and settled down to wait, picked up my phone, reached for my coffee… I had left it on the kitchen surface godammit. After the doctors, I gazed longingly at Costa on my way to the gym but decided to skip it and see what happened if I tried to run without my morning hit! It was not so bad, definitely not as bad as yesterday, still not doing great at it but I managed a 5k and lifted some weights, so I felt pretty pleased with myself. Heading home, I got myself showered, changed and packed and off to the train station to visit my friend Jenny for a couple of days. 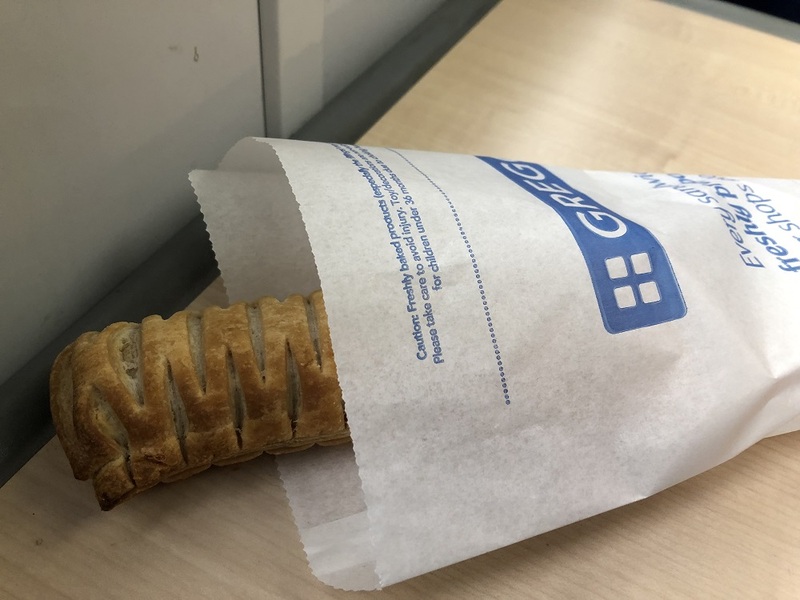 Obviously, I had to try a “controversial” vegan sausage roll from Greggs on the way. I grabbed three and scoffed one and some juice on the train. Never having eaten a regular sausage roll I cannot say whether this tastes like meat or not, but it is tasty, I have had nicer ones though. Fry’s are my favourite. The general consensus seems to be that they have the taste, but not the texture and greasiness of a regular one. Whatever the case they are going to come extremely handy for staying on the vegan path the next time The Killers tour. Checking my emails on the train I finally got the results on an MRI scan I had done back in September. A confirmation of moderate chronic subacromial supraspinatus tendon impingement in my right shoulder. The prognosis is a full recovery within another 6 months with steroid injections. I look forward to those then!! I reached Jen’s around 2 pm and, after a short walk to Sainsbury’s for supplies we had some dinner (sorry, I was too excited to eat it to take a photo today! ), Vivera Vegan Shawarma with hummous, pitta, and McCain’s Shake Shake salt and pepper chips again. We spent the rest of the evening chatting and playing Sims4 until it was time to go to bed ( the money tree is the BEST THING EVER!). I settled down and began reading book 2 of 52 for 2019. The next in the Vampire Chronicles series, Merrick. I only read one chapter, but I already like it lots better than Vittorio, and it has the bonus of being a crossover with the Mayfair Witches series. I think I am going to love it.